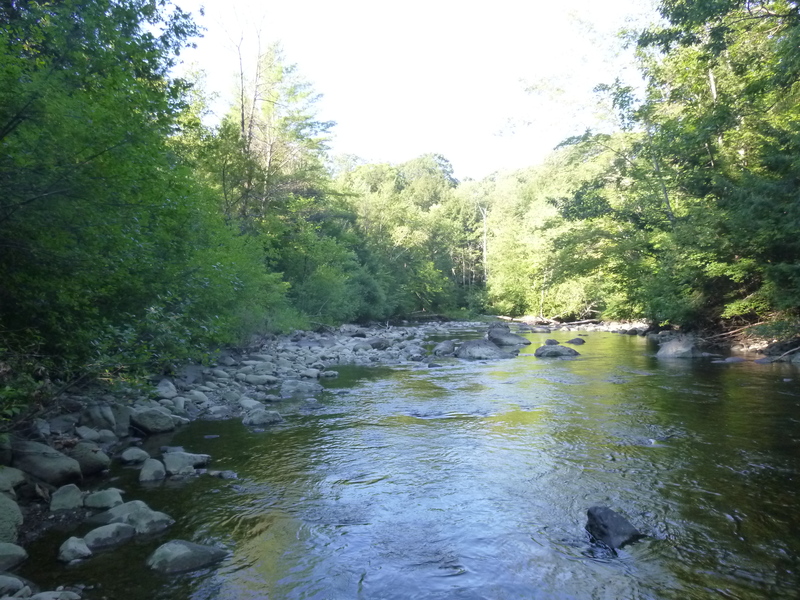 The Mascoma River near Mill Road, Lebanon, was quiet when we visited in August 2013. The gift of 1.7 acresÂ in the floodway of the Mascoma River protects clean water and provides space to absorb the force of spring floods and catastrophic weather events. The Lebanon property was donated to UVLT by Carl Back in honor of his mother Irene. When Pete Helm and I visited the land prior to accepting the gift, we were struck by the amount of silt and flood deposits it was holding. 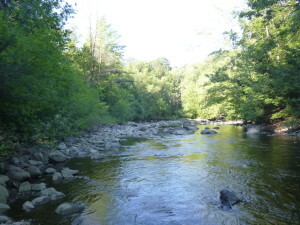 The land lies in a low spot between Mill Road (a Class 1 Trail) and the Mascoma River. On the other side of Mill Road, the land rises very steeply, supporting Route 4. The slope is riddled with culverts and slides carrying runoff from Route 4 and the slopes above it. What stands between the muddy water and the Mascoma River? UVLT’s new Mill Road Floodplain Reserve. The Lebanon City Master Plan states that “protecting the quality of the waters in the Mascoma River is a paramount issue.” A Natural Resource Inventory prepared for the City identifies the Mill Road property as a â€œsignificant ecological area.” All of the soils on the site are classified as hydric, or very wet. 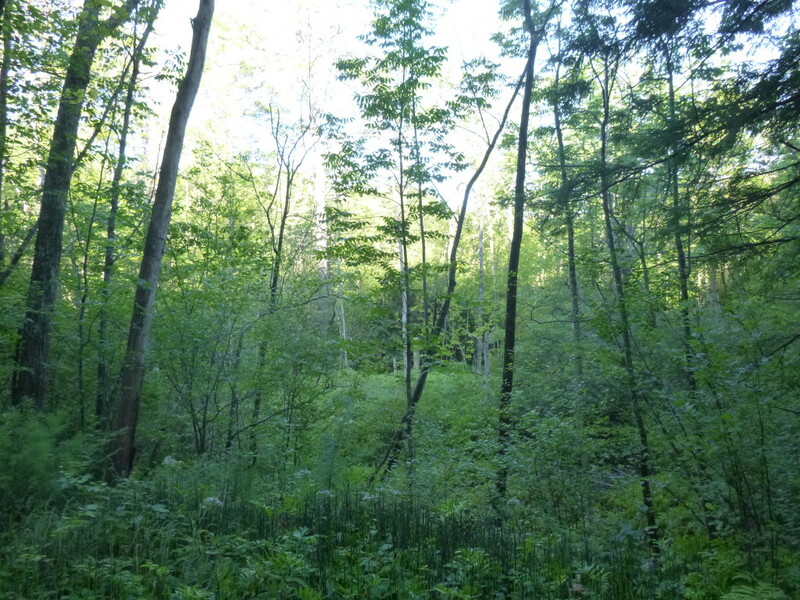 UVLT intends to keep this patch of floodplain forest as a sediment and flood water storage area to help protect the water quality of the Mascoma River.Â There is active public recreation along the Mill Road trail, which makes up the eastern boundary of this property. There are a few small paths on the property which follow along the river and are used by wildlife and the occasional fisherman. We believe that the phrase ‘sometimes the best management is no management’ is apt for this property and won’t be planning any forestry activities or formal trail construction. This little parcel isn’t the prettiest or the most pristine property we’ve conserved. But beauty is in the eye of the beholder, and there is a lot to learn about and appreciate when it comes to the functions of healthy floodplains. Perhaps next spring we’ll be tracking the amount of erosion caught and filtered by our new property, or calculating the volume of snowmelt it holds. Stay tuned and learn with us! We (all) Did It! Alswell Farm Conserved.